DominoMcGee wrote: Huge fantasy series tend to have massive and awesome canons, which is what people love. Tolkein did it in four books, though. The book divisions within the three books is irrelevant. In terms of book sizes, Tolkien did it in The Hobbit, The Fellowship of the Ring, The Two Towers and Return of the King. I would take a picture of my "thigh" too but I'm away from camera. I can only assume you've never actually read the novel, because if you were to do so you would notice that each of your volumes contains two books. This is a fact. BIG YUS wrote: I can only assume you've never actually read the novel, because if you were to do so you would notice that each of your volumes contains two books. This is a fact. First of all, there are contradictions right in your post. And yet there are supposed to be six books? Aha! More scientific evidence was required here to prove your retarded crackpot theory wrong. That's right. Choose your favorite passage from the trilogy and I will choose mine. We shall read off. Let the best man determine the number of books in the series. If I win, there is one book to rule them all. If you win, you can live in your pretender's universe with six lord of the rings books. I hardly think this is worth arguing over. But I'm probably wrong. SlappyMcGee wrote: Four good ones! It's one novel divided into six books and often published as three volumes. Please do not be so dense as to presume these books must be physical books, or I'll have to point out the incongruity of your earlier example which included Kafka's "Metamorphosis and Other Stories", where you have one physical book whose contents are clearly divided in a different fashion. I have a one-volume copy of The Lord of the Rings, but that doesn't mean The Lord of the Rings only consists of one book. And again, if you have read it, you would have surely noticed the various pages conspicuously titled "BOOK ONE", "BOOK TWO", "BOOK THREE", "BOOK FOUR", "BOOK FIVE", and "BOOK SIX". And I'll totally read you off. squibbles wrote: If you want a fantasy series that isn't too derivative of LotR like 90% of the genre, and also explores the human condition in a sensible and interesting way, I'd recommend The Chronicles of Thomas Covenant, The Unbeliever. It's really damn good and best of all, 10 books long. Being busy and reading a good book are two very different things. When you say that a series is good, that implies it's whole. I'm pretty clearly stating that it's 10 good books. Unfortunately, I have to get serious and chime in on Slappy's side of the argument. 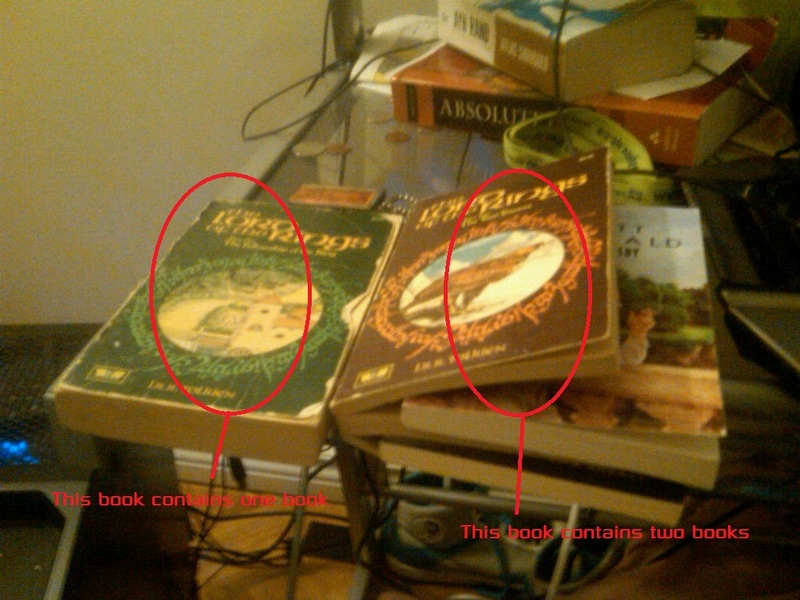 Tolkien himself wrote them as three books. This is fact. It is also fact that they were published as six books due to a silly publisher's opinion of humankind's attention span, with some other factors tossed in. boustrophedon wrote: Unfortunately, I have to get serious and chime in on Slappy's side of the argument. Tolkien himself wrote them as three books. This is fact. It is also fact that they were published as six books due to a silly publisher's opinion of humankind's attention span, with some other factors tossed in. Hahaha, what. Tolkien wrote it as six books in one volume, expecting it to be accompanied by The Silmarillion. The publisher thought otherwise and published it on its own split into three volumes. SlappyMcGee wrote: If I win, there is one book to rule them all. What happened to three books? Wikipedia wrote: Although known to most readers as a trilogy, the work was initially intended by Tolkien to be one volume split into three sections. Huhwha that was a pipe dream. Quite early on he decided to publish much earlier than Sil because he wanted to flesh it out and anyway it really wasn't publishable. Also I meant three voolumes rather than three boooks. First of all, right back at you! Second of all, clearly that quote means I'm right. It's not quiiiiiiite fantasy, but close enough for all practical purposes -- The Illuminatus! Trilogy is the best thing I've read save Infinite Jest (which is definitely not fantasy). and then the latest I read was Nick Perumov Elven Blade..